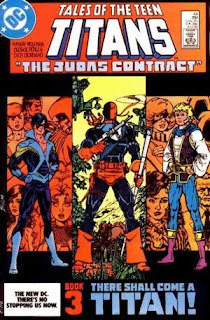 This 'graduation' to me, is one of the defining moments in DC's history and it's brilliant to see it getting a little more air time. When it happened in the comics, it represented a pretty risky move, effectively removing the image and name of one of DC's biggest worldwide icons, and greatest lunchbox sellers, all for the sake of character development. It's enough to make a marketing team cry. I'm sure it did - but it worked. 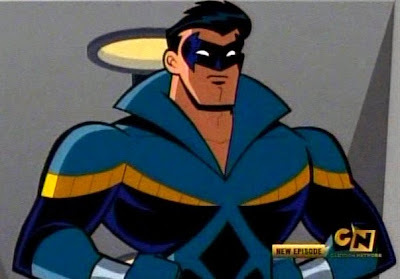 While new Robins have since filled the void, and the disco collar has been replaced by a sleeker set of duds, 'Nightwing' has never been retconned. Rather he has gone on to be one of the most fleshed out characters in the DCU, partly because readers literally got to grow up alongside him. On a semi-related note, I thought I'd chuck up this; my first ever published piece of 'fan art' from the gallery page of Previews, April 2002. Showing my age, in that while everyone else was submitting works featuring Batman, bad girls, or Spawn, here was this then 22 year old, dipped in nostalgia, handing in a piece inspired by the Wolfman/ Perez run on New Teen Titans. 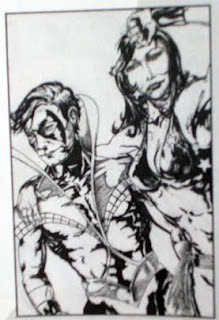 Featuring 'disco collar' Nightwing and 'Wonder Girl' Donna Troy, sure the proportions are out all over the place, but even now just that character difference makes me smile.